Corsair Vengeance Pro Series memory modules are designed for overclocking on the latest 3rd and 4th generation Intel Core platforms, with eight-layer PCBs and ICs specially selected for performance potential. The aluminum heat spreaders provide superior temperature management and have the aggressive look you want in your gaming rig. XMP 1.3 profiles allow for automatic, reliable overclocking. 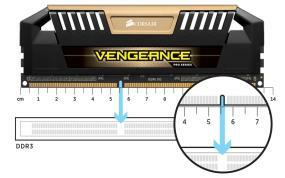 Vengeance Pro Series memory works on any motherboard with standard DDR3 memory slots. Vengeance Pro Series is available in your choice of colors to match your motherboard, your components, or your personal style. 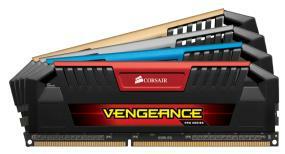 Corsair is a top manufacturer of high-performance memory. We’ve been providing enthusiast-grade memory for PC systems for a long time and offer broad selection of enthusiast memory products. Whether you're upgrading a system, building a fast and responsive gaming rig, or attempting to break overclocking world records, Corsair has a solution for you. This 16GB kit contains two 2400MHz 8GB modules with gold-colored heat spreaders.